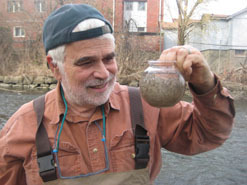 Alewives (river herring) joined glass eels as another spring migrant in from the sea. 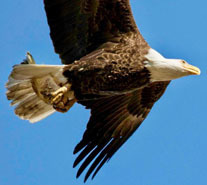 The number of successful bald eagle nests was increasing. There were now so many bald eagle nests in the watershed, many not being closely monitored, that we had to extrapolate their success from those we know. 4/3 – Adirondack Mountains: In seasons past, Dr. Bob Schmidt and I have had an informal, somewhat competitive, search for the largest white sucker (Catostomus commersoni) in the watershed. Bob’s 510-millimeter (mm) sucker (20.1-inches) had been topped only by my 520 mm (20.4-inches) fish, both caught in tidal tributaries. These two appeared to be at the size-ceiling for the species, at least in our watershed. [Note: one inch = 25.4 millimeters (mm)] [Suckers, in general, are elongate and terete in cross-section. They have what ichthyologists refer to as an “inferior mouth,” in that it is angled downward. This adaptation allows suckers to effectively feed off the bottom where they find a broad variety of insect larvae. With a snorkel mask you can watch them inhale a mouthful of bottom sand and sediment, sort out the edibles, and then exhale the rest. 3/30 – Newcomb, HRM 302: We ventured to Newcomb today to check our camp that was still closed for the winter (our long driveway requires snowshoes to traverse in winter). There was still a snow-pack of three-feet in the woods, and the roadside banks were even deeper. Goodnow Flow (lake) was still frozen, but the various feeder streams were moving freely and beginning to erode the lake ice where they entered. The earliest I have been able to open our camp was April 16, eight years ago. I generally can open when the ducks can no longer ride the ice floes. 3/30 – Minerva, HRM 284: We still had three-feet of snow in Minerva. The sugar maple sap was running a little better, but it will not be the big season we had for maple syrup last year. So far, I've made a pint of dark, sweet syrup. Presently, I've got sap on the stove boiling down to evaporate the water. Last year, I made well over half a gallon. I visited the local commercial maple syrup business in Minerva and heard that it might not be a great year for them as well. Meanwhile we’ve had a scattering of robins and some red-winged blackbirds passing through. Spring is coming, slow but sure. 3/30 – Bedford, HRM 35: The great blue heron rookery now appeared to have 17-occupied nests. Seven nests had a pair of herons with one incubating and the other standing guard either on the rim of the nest or on a nearby branch. The guardians usually pass the time preening their feathers. The remaining nests had a single heron incubating with its mate most likely off hunting. This will be the routine for the next month until the eggs begin to hatch. 3/31 – Warren County, HRM 232: Driving south on Route 40 near DEC Headquarters in Warrensburg, I counted five bald eagles (four adults) spread across the Hudson River, standing on rocks in the shallows looking upstream, always hunting. One of the adults had a fish that it was busy dismembering. It was such a surreal moment! 3/31 – Black Creek, HRM 85: It was raining this morning near high tide as we picked our fyke net in Black Creek. We counted 743 glass eels. We do not usually see so many eels this early in the season. The water was 50 degrees F.
4/1 – Hudson Valley: Earlier in the year, we suggested using caution when approaching bald eagle nests, especially when they were incubating. That plea for temperance of enthusiasm becomes even more critical when nestlings are present. Nestlings, as well as the adults, frighten easily with human intrusion. We should extend that caution to include all nesting birds and their nestlings. Potential consequences of our carelessness include nest abandonment and premature fledgling. We must let the power of our optics (binoculars and cameras) get us as close as we need to be. 4/1 – Manhattan, HRM 1: We checked our research sampling gear in Hudson River Park at The River Project's sampling station on the lighthouse tender Lilac at Pier 25 and found a meager catch of shore shrimp, amphipods, and a mud crab. This seems like the Lull before the Fish Storm! 4/2 – Norrie Point, HRM 85: We got lucky today and witnessed a food delivery to bald eagle nest NY142, across the river in Ulster County. One of the adults was perched just off the nest when the second adult arrived. For the next five minutes, there was much feeding activity both inside and outside the nest. Although we could not see nestlings, the food delivery and feeding behavior suggested there may have been one. The timing was right as apparent incubation began on February 6 and adult recognition of something in the nest (eggs?) began on March 20. 4/2 – New Hamburg, HRM 67.5: Bald eagle nest NY459 had become an enigma. We had not seen any adult activity in more than a week. Yet today, there was an adult in the nest and the other adult was perched ten feet way. Were they still trying? Or was this instinctive remorse for eggs that did not hatch? 4/2 – Yonkers, HRM 18: After two days of impressive glass eel numbers (March 26: 103; March 28: 53) our 9-11 grade students from the Bio-Chem program at Saunders High School in Yonkers caught 73 today in our eel mop. Across these eight days, the water temperature had risen from 47 to 50 degrees F.
4/3 – Manitou, HRM 46.5: Nearby bald eagle nest NY527 appeared to have a nestling. We watched an adult feeding at least one eaglet today, and we could see a gray downy head reaching up to be fed. Both parents have been quite attentive during feeding and with nest maintenance. 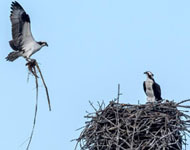 4/3 – Verplanck, HRM 40.5: It is with great pleasure that we observed that the pair of osprey had returned to the channel marker off Steamboat Dock in Verplanck. This was at least the third year for this nesting pair. Every day we have watched tirelessly searching for just the right branch to bring back to the newly refurbished nest. The pair accumulates quite a nice bundle of sticks each season but the Coast Guard Aids to Navigation team clears off the markers each spring before the birds arrive. This usually necessitates a complete rebuild. 4/4 – Warren County, HRM 230: We could still feel the chill of winter in the air. A month earlier I was ice-fishing on Lake George; now remnants of the ice began 100 feet offshore and extended up the lake to the north as far as we could see, which soon became a diminishing view. What began as flurries soon built into a snow squall, and then a total whiteout. Common loons (Gavia immer) – three of them in breeding plumage – were there diving for fish. These were the great northern divers, as they are known in Europe. Has there ever been a more appropriate name? 4/4 – Washington County, HRM 192-191: One of the best locations to see both variety and numbers of returning waterfowl in spring is Thompson Island Pool on the Hudson River. The jewel of the pool today was several hundred snow geese. Their voices. coupled with assorted-sized rafts of Canada geese, bufflehead, common mergansers, common goldeneye, ring-necked ducks, and greater scaup, created a loud symphony if not a harmony. 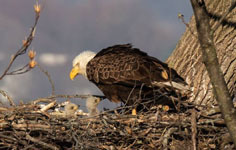 4/4 – Town of Poughkeepsie: There was much activity at bald eagle nest NY62 today, the highlight of which was when an intruder, an immature bald eagle, arrived and flew over the nest. The adult male from NY62 went up to head it away. Eventually, the female came off the nest, knowing her nestlings would be alright for a short period of time, and the two of them were able to chase the intruder away. 4/4 – New Hamburg, HRM 67.5: Just two days ago, we were thinking bald eagle nest NY459 had failed. Today, I made a commitment to watch the nest for an hour. It was not long before an adult flew into the back of the nest. At the same time, the other adult was up and out the “front door.” A change-over. That adult had been deep in the nest, out of sight. That may have been the reason that we missed the incubation. In light of today’s activity, it seems NY459 might still be in play. 4/4 – Haverstraw Bay, HRM 36: Our DEC Hudson River Fisheries Unit crew was on Haverstraw Bay today gill-net sampling for immature sturgeon, and we caught two alewives, both males. These were the first ones of the season. 4/4 – Yonkers, HRM 18: On a windy and warm day, our 9-11 grade students from the Bio-Chem program at Saunders High School in Yonkers caught 19 glass eels today in our eel mop as well as two elvers (probably last year’s glass eels). The water temperature continued to rise, now at 53 degrees F.
4/5 – Haverstraw Bay, HRM 36: Our DEC Hudson River Fisheries Unit crew was on Haverstraw Bay again today gill-net sampling for immature sturgeon, and we caught two more alewives, this time both females (265, 289 mm). Now that winter has slowly retreated to points north, much of the watershed’s ponds, creeks, lakes, and rivers are ice-free and we are recovering from our winter fish withdrawal. For 13 weeks our Fish-of-the-Week feature has helped during a bleak fish-less winter. It has worked so well that we may continue the feature, at least until we get tired of taking space from real fish stories. [Alewife (Alosa pseudoharengus) is one of two river herring that includes blueback herring (A. Aestivalis), that stream into the Hudson River estuary by the millions each spring to spawn. They penetrate far upriver into tidewater tributaries. Some are lifted above the Federal Dam at Troy, climb the Waterford Flight, and venture far to the west in the Mohawk River. Alewives are usually the first river herring to arrive in late March. Blueback herring, with slightly different timing, ordinarily arrive by late April. 4/5 – Rockland County, HRM 33: I’m pretty confident that bald eagle nest NY336 has a nestling. The behavior of the adults has been consistent with what I learned observing other eagles on nest cameras. The female has begun to sit higher in the nest, and while I have not seen food brought to the nest, the female appeared to be tearing food apart and then dipping deep inside the nest. The male has been consistently near the nest, especially around sunset when he settles into roost. Seminar on Fishing for Carp! The Hudson River Research Reserve and the Carp Anglers Group will conduct a hands-on seminar to teach and promote the sport of angling for common carp (Cyprius carpio). Join us this summer as we explore the Wonders of Wetlands. Teachers will spend two days gaining valuable knowledge and learning new curricula. We will use interdisciplinary approaches with the guidance of experts like EPA Award Winner Chris Bowser. Join us this summer as we explore amazing watersheds. Teachers will spend three days gaining valuable knowledge and learning new curricula while using interdisciplinary approaches to explore watersheds. Some easy hiking on trails is involved. You can share your fishing trip information and help biologists understand and manage our Hudson River striped bass fishery. Here’s how it works: Fill out a logbook provided by us whenever you fish on the Hudson River (by boat or from shore). Record general location, time, gear used, what you caught (or if you didn’t catch anything) and return the logbook when you are done fishing for the season. You’ll receive an annual newsletter summarizing the information in addition to the latest news regarding regulations and the river. Whether you catch-and-release or take home a keeper, you can be part of the Cooperative Angler Program. The Hudson is measured north from Hudson River Mile 0 at the Battery at the southern tip of Manhattan. The George Washington Bridge is at HRM 12, the Tappan Zee 28, Bear Mountain 47, Beacon-Newburgh 62, Mid-Hudson 75, Kingston-Rhinecliff 95, Rip Van Winkle 114, and the Federal Dam at Troy, the head of tidewater, at 153. The tidal section of the Hudson constitutes a bit less than half the total distance – 315 miles – from Lake Tear of the Clouds to the Battery. Entries from points east and west in the watershed reference the corresponding river mile on the mainstem. The Hudson River Almanac is compiled and edited by Tom Lake and emailed weekly by DEC's Hudson River Estuary Program. Share your observations by e-mailing them to trlake7. To subscribe to the Almanac (or to unsubscribe), use the links on DEC's Hudson River Almanacor DEC Delivers web pages. Discover New York State Conservationist - the award-winning, advertisement-free magazine focusing on New York State's great outdoors and natural resources. 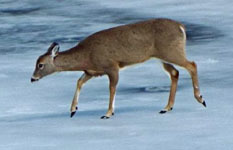 Conservationist features stunning photography, informative articles and around-the-state coverage. Visit the Conservationist webpage for more information. National Oceanic and Atmospheric Administration online tide and tidal current predictions are invaluable when planning Hudson River field trips. For real-time information on Hudson River tides, weather and water conditions from sixteen monitoring stations, visit the Hudson River Environmental Conditions Observing System website. DEC's Smartphone app for iPhone and Android is now available at: New York Fishing, Hunting & Wildlife App.